It apes one of the most iconic electric guitars, but is a tidy, well-made hot-rod S-type that punches well above its price. Will satisfy your inner EVH. Sounds and plays brilliantly in any high gain rock scenario. Well built. Great value. Neck finish wears off quickly. Players of a certain age might well be going misty-eyed looking at the images of this guitar. Few custom instruments conjure up a period of rock music quite like this. Modelled, of course, on EVH's second-generation 'Frankenstein', the Striped Series is available in three gloss colour combinations, covering its basswood body - all have the same minimalist specification. "The neck - Fender headstock aside - seems to be closer to the more modern Wolfgang designs"
It's no slavish recreation of that fabled guitar, though. Yes, we have the single direct-mounted humbucker, the Floyd Rose and the single volume with a Strat's 'tone' knob, but the neck - Fender headstock aside - seems to be closer to the more modern Wolfgang designs: a quartersawn slab of maple, with graphite reinforcement, topped with a compound 12- to 16-inch radius, jumbo frets, easy-to-adjust truss rod and a light oil finish. Hardware centres around the Floyd Rose, with the D-Tuna fitted to the low E string to allow instant dropped D tuning. It's the Korean-made 1000 Series specification with a nickel-plated brass block, hardened steel base plate and saddles. Van Halen sets the vibrato flat on the body with no upbend, so setting up and tuning the vibrato and the D-Tuna is actually pretty easy. There's no spec on the pickup, although its 13k ohms plus DC resistance tells us it's a lot more powerful than the PAF-style bucker on EVH's original. And despite the single volume control, the rear cavity is standard sized - if you wanted to add a tone control it would be an easy DIY install. Another nice touch is the Les Paul-like square metal jack socket mounting - very road-ready. "It is simply a superb platform for any style of gymnastic rock"
With the exception of the Les Paul Junior, single-pickup rock guitars such as this are pretty rare. 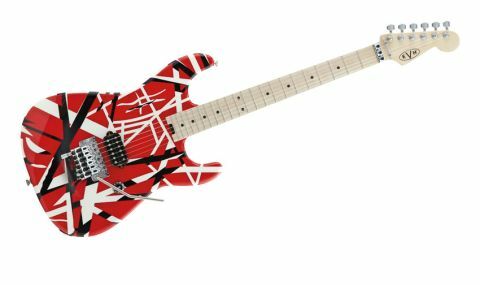 But like the LPJ, the Striped Series' minimalism is refreshing - it is simply a superb platform for any style of gymnastic rock - we can't help thinking that EVH is missing a trick by not offering the guitar in some standard colours, though. The flat fingerboard radius, big frets and very slightly flat-backed D shape neck profile - a slim but not over-thin 20.2mm at the 1st fret, 21mm at the 12th - immediately gives it a very specific feel, and set up with a low action and 0.009 strings your left hand is free to move effortlessly... as fast as you can manage. The oil finish is light, and already after only a demo session the face is beginning to look dirty and the neck back becoming a little 'furry', as any sweat penetration begins to lift the grain slightly. If you're serious about your oil-finished neck, be prepared to do some maintenance: rubbing it down, re-oiling and/or waxing. We doubt anyone is going to use this clean, but it's no bad sound, not least with lashings of modulation. As we raise the gain, it moves from okay to... yeah! It's not long before we're grinning from ear-to-ear. There's a real throaty, woody, resonant thump here - a humbucking Strat has always been a favourite, and anyone who sticks their nose up at a Floyd Rose for being a 'tone drain' really hasn't experienced what we're hearing. Again, the seat of your pants ride reminds us of a Junior, but where that guitar would be screaming uncontrollably at these levels the only screams we hear are from the (imaginary) stadium audience... along with vibrato dips and dives, pinched harmonics and, if you can do it, a bit of tapping, too. All too soon, our time is up... the guitar's fingerboard now a darker shade of grey. We need a sit down. This guitar was launched in January 2013 - it's taken us more than a year to get a review sample, as demand has outstripped supply. That appeal must lie with the legions of us who remember Eddie in his heyday. It seems a little like a guilty pleasure, but it's a built-for-purpose virtuoso rock machine that feels, thanks to the oil-finished neck, a little more intimate than many more clinical-feeling modern rock guitars. It's also a perfect platform for your own mods, which we'd hope Eddie - as one of the world's most famous guitar tinkerers - would approve of.